Treat yourself to a leisurely tropical beach experience in this luxurious resort village, offering exciting adventure tours, beautiful beaches and first-class golf. 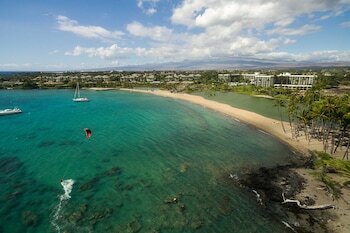 Waikoloa is a lavish resort village overlooking a blue-green lagoon and the rolling surf breaks on Waiulua Bay. Pamper yourself at one of the village’s resorts, admire the scenic waterfront, go snorkeling in the bay, play a round of golf or relax by the resort pools. Visit some of the region’s breathtaking destinations with a helicopter or boat tour. Go whale-watching on the Kohala Coast or try deep-sea fishing. Scuba dive in the crystal-clear Hawai’ian waters to see beautiful coral reefs and tropical marine life. Experience the natural wonder of Kileaua on a volcano tour and see lush rainforest and shimmering waterfalls. Some resorts offer day passes to visitors so you can enjoy an exciting daytrip on the resort grounds even if you aren’t staying in Waikoloa Village. Bask in the warm sunshine by the pool or explore the family-friendly adventure pools, complete with waterslides and snorkeling lagoons. 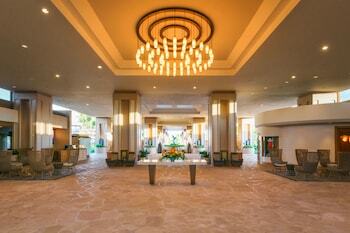 Treat yourself to a luxury spa visit or hit the resort’s gym. Visit Anaeho’omalu Bay to explore this beautiful crescent-shaped beach. Spot multicolored coral on a snorkeling trip or a glass-bottom boat ride. The waterfront lava rocks are dotted with ancient Hawai’ian fishponds and majestic turtles can often be seen sunning themselves on the sand. Find equipment rentals and tour agencies on the beach. 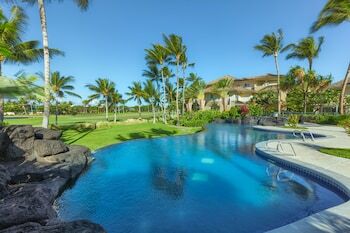 Enjoy a couple of leisurely rounds of golf at the resort golf courses and see magnificent views of five volcanoes and the Kahala coast. Tennis courts are also available at many resorts. Hit the Queens’ Marketplace Shopping Center to discover a range of retailers, including clothing boutiques, cafés, restaurants and stores selling Hawai’iana souvenirs and keepsakes. 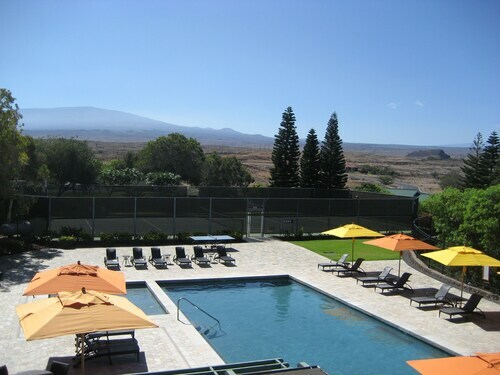 Waikoloa Village is located in the Big Island’s Kona region, just off the Kohala coast. The village is approximately 20 miles (32 kilometers) north of Kona International Airport. Explore this area with a rental car or join a charter tour. Visit between September and October to experience this luxurious resort village during off-peak season. 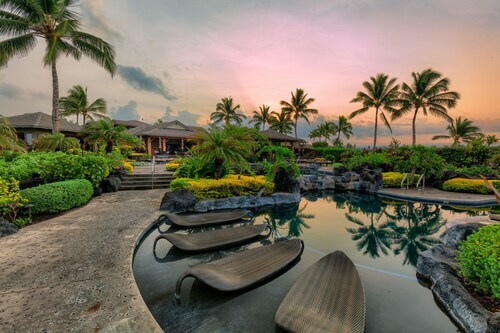 Using Expedia's hotel booking website provides a simple way to locate a hotel in Waikoloa that suits your budget and taste. 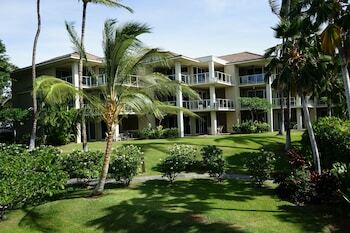 To fully enjoy island life, consider staying at the Lava Lava Beach Club and Mauna Lani Terrace Condominium. Going on a break isn't just about ticking off places on a map. It's about the friends we make and the adventures we have on the way! 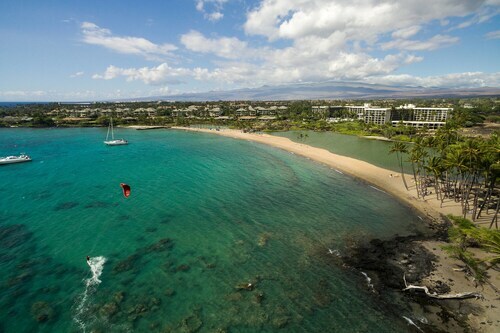 To take a look at all the activities on offer, jump onto our Waikoloa things to do page. The room was very nice and big. The Balkons was super. Very nice and clean property. Staff was very friendly and helpful. Good for families. Friendly staff. Nice pool with small restaurant perfect to end day with. Lovely property, but please don't support dolphins in captivity! Spacious and lovely condo. Quiet location and great pool. Excellent family friendly resort. Rooms were clean and equipped with everything a family needs. YTO-All Airports - Kona Intl.